SMTP is the short for “Simple Mail Transfer Protocol”, which is a kind of technologies used all around the world when sending or receiving email. Although it is limited in its ability to queue messages at the receiving end. This simple, text-based protocol continues to be the norm. If someday your friend call you for a very important pdf file,and you only have .doc format one in your computer,how to print the word file to pdf and how to send it to your friend immediately?By using the software PDFcamp Printer you can realize many powerful functions,for example,it has a mail function so that you can mail your generated pdf files to your friend directly. Let me show you how to do step by step. 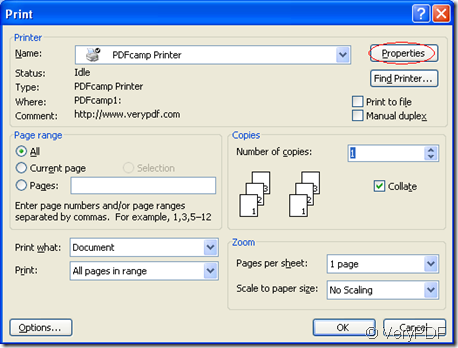 First,open a document such as word,excel,powerpoint,etc.and click “file”,then “print”. Second,there is a popup window in which you should click “properties”to set parameter. Third,you will see “Email” in properties,please click.You should check”Sent mail directly through SMTP server” ,There is an important one which is named outgoing SMTP server,you should type in you SMTP server before sending email.For example,mine is smtp.live.com,and there are different SMTP servers which you can find on the Internet.Then write the address of consignee and other useful information.When everything is done,press “ok”. Forth,save and name the file. 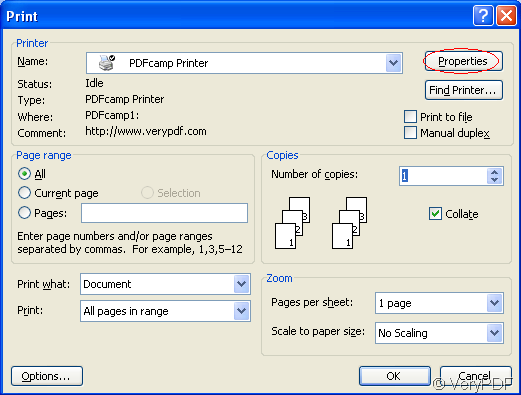 If doing so like me,you can email the generated pdf file silently to your friend by PDFcamp Printer. Do you know how to convert PICT file to PDF file? How to print from Chrome Web Browser to PDF document?